1. 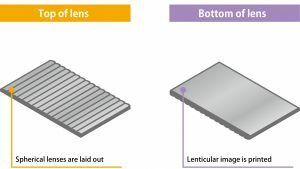 What is a Lenticular Lens? 1 What is a Lenticular Lens? Semi-cylindrical lenses are arranged side by side on the top surface of the lenticular lens, and images are printed on the bottom surface. This makes it possible to view printed matter as a 3D image from the top. The top surface of the lens has semi-cylindrical convex lenses arranged side by side. When the image printed on the bottom surface is viewed through the lenses, the pattern changes according to the viewing angle, making it possible to express flat images three dimension-ally. Because a person’s left and right eyes view the image from different angles (parallax), the focal point of the convex lenses is different according to the viewing angle, and the im-age can change or can appear to have depth. Printing is done on the bottom surface of the lenses. Regarding the images used for lenticular printing, at least two different images are divided linearly and placed alternatingly (interlaced image). 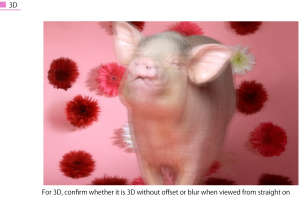 To make a “3D” image, up to 20 images can be placed alternatingly to create an interlaced image. When viewed through the convex lenses, the left and right eyes view only a certain line of the image due to parallax, making images appear three dimensionally. 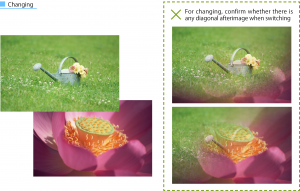 In order to perform lenticular printing properly, adjustments are made by viewing markers. With LentiDotManager, three types of markers are used. Striped Lines are vertical lines that surround the four boarders of the printed matter. These are used for adjusting the tilt of the lens. When printing, you can select either Top-Bottom, Left-Right, or Top-Bottom-Left-Right from LentiDotManager by going to [Left-Right / Top-Bottom Stripe] in [Accessory Information Settings]. It is also possible to specify the width and height of the stripe. This is used for confirming the pitch. 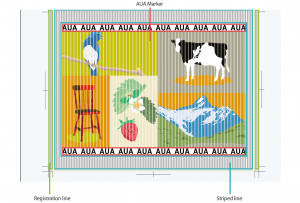 AUA Markers are markers that are printed at the top and bottom on the inside of the striped lines of the printed matter. When the pitch is correct, the letters “AUA” can be viewed clearly. 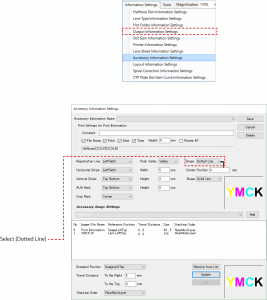 When printing, you can select either Left, Right, or both from LentiDotManager by going to [AUA Mark] in [Accessory Information Settings]. It is also possible to specify the height of the mark. Registration lines are vertical lines outside striped lines. These are used for adjusting the tilt of the lens. Overall tilt adjustments are made using the striped lines, and detailed adjustments are made using the registration lines. For registration lines, you can select either Left, Right, or both from LentiDotManager by going to [Registration line] in [Accessory Information Settings]. 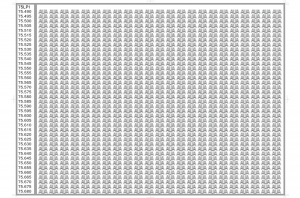 Solid lines can be made dotted so that color registration can be matched more easily. Now, let’s actually perform lenticular printing. Adjust the lens tilt and color registration to create a beautiful lenticular print. 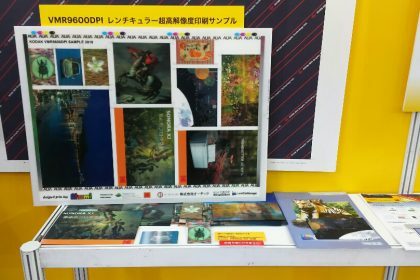 As with normal printing, use waste paper for lenticular printing, print onto the lens, and then perform tilt adjustment and color registration. Adjust the tilt of the whole lens. Adjust the horizontal lines so that the striped lines become either completely white or black. Method:Adjust the horizontal lines so that the striped lines become either completely white or black. Rotate the lens sample 90 degrees to view the horizontal stripe horizontally. Swing it back and forth (vertically), and if the striped line switches between white and black evenly, it matches with the lens. Depending on the type of CTP, there are cases where images are greatly tilted due to the spiral correction function. By making corrections and outputting the plate again, the initial tilt can be minimized (for more details, see 4-1-2 Correcting Registration Offset on the Plate). Now, let’s adjust the tilt of the whole lens more accurately. The ends of each lens may not be aligned, so check multiple items that were printed together. Adjust the color registration. Let’s confi rm the position and tilt of each color. 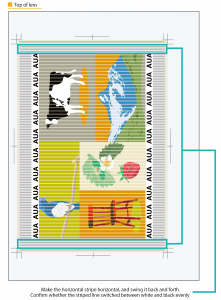 See the AUA Mark and the striped lines at the top and bottom to confirm whether the lenticular print pitch is correct. Let’s confirm whether the lenticular print looks good by viewing actual printed matter. 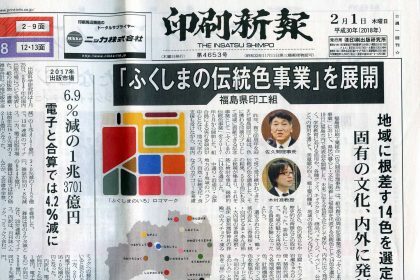 If it is crooked or partially switched, the image is tilted. Go back to 3-2 to 3-5 (see 3-2 Adjusting the Tilt of the Whole Lens 1) and reconfirm that color registration and pitch are correct. There are many possible causes for streaking with lenticular prints. If adjustments by printing are insufficient, it is necessary to return to the previous process to make adjustments. There are cases where plates are offset because the lens pitch does not match, and where color registration adjustments do not match. 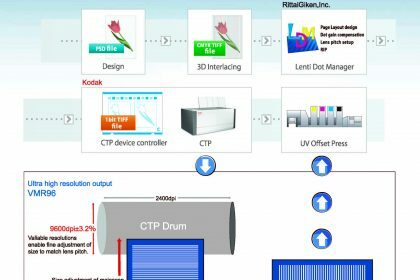 In such cases, print quality may be improved by making adjustments using LentiDotManager. If it is possible that the pitch does not match, place the unprinted lens on the CTP plate for pitch measurement to reconfirm the pitch. Input the correct pitch, and output the plate again. The CTP plate for pitch measurement can be used repeatedly. Use this to measure the pitch for the same type of lens. Output the chart to the CTP plate, place the lens on it, and then measure. When a lens is rotated by 90 degrees and used, the pitch changes according to the blanket thickness, etc. , so print on to the lens, and then measure the pitch. Because the influence from the blanket, etc. 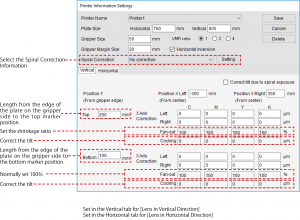 , is constant, it is possible to measure using the CTP plate by acquiring the factor. Overlap the lens and chart. 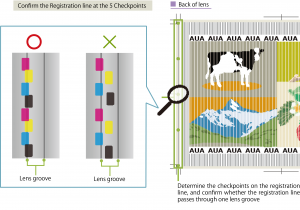 View the line between the number and AUA, and make the lens and chart parallel. 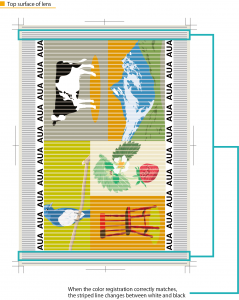 Stand directly in front of the AUA at the left-most column and move the lens so that all AUA in the column appear clearly (Figure 1). 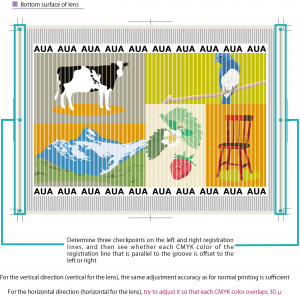 Without moving the lens and chart, move your body and stand directly in front of the next AUA column, and find the row where the AUA can be clearly seen. Do this in order from left to right starting from 1 (Figure 1) For a thin lens, when stretching to the right, the lens stretches, which changes the pitch. When a transparent sheet is placed, the bottom lens does not stretch, so hold the lens down from above the sheet and look while stretching to the right. 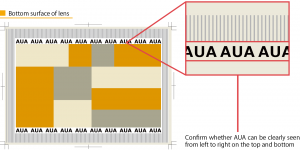 When viewing AUA in order from the left, the AUA text begins to blur from the top or bottom of the chart (Figure 2), which means that the pitch for that row does not match. 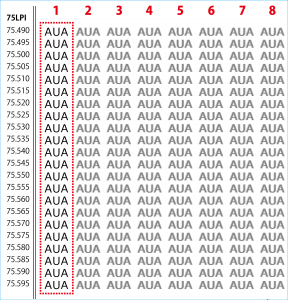 View these in order from left to right and record the number of the row where all AUA text can be seen clearly. This number is the Mechanical Lens Pitch. When the lens and image registration do not match, or when each color registration does not match, it may be possible to improve it using fan-out correction (trapezoid correction). * It is not necessary to change the fan-out correction each time. When type of lens is the same as the previous print, the same tendency will exist even if the pattern is different. For [Position from Gripper] in [Top Trapezoid Correction Line], set the length from the edge of the plate on the gripper side to the top marker position, and for [Position from Gripper] in [Bottom Trapezoid Correction Line], set the length from the edge of the plate on the gripper back side to the bottom marker position. Depending on the type of CTP, there are cases where images are greatly tilted due to spiral correction function. By using both fan-out correction (trapezoid correction) and cocking correction (tilt correction), it is possible to make images nearly horizontal. From the LentiDotManager [Accessory Information Settings], when Registration line is set to [Dotted Line], the lines are offset according to color, which makes it easy to match the color registration. There are cases where correct lenticular printing cannot be performed due to problems with the lens sheet. Reexamine the storage method for the lens sheets, etc. If lens sheet aging (curing) is insufficient, lenses can become wavy, making it impossible to make a good print. This can be checked by simply placing the lens on a flat surface. 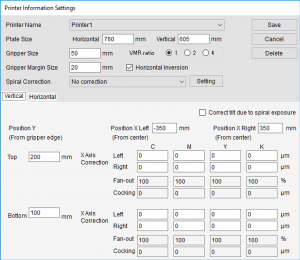 The lens pitch changes according to the lens thickness, maker, and lot production period. Even when the maker is the same, there is a difference in print ink application and pitch because the environment changes due to production location and season. Lenses can shrink or expand according to changes in season, time, day, etc. When lenses are stored by stacking, there is a difference in temperature between the edges and center portion of the lens, which creates distortion. Store lenses in a constant environment. For lenticular prints, color registration adjustments are much more difficult than for normal printing. 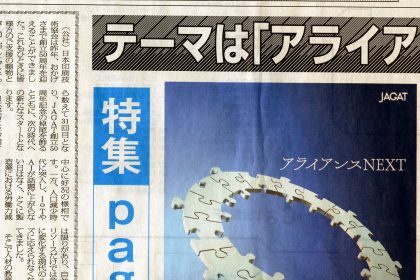 In particular, have the maker make adjustments to the printer so that it meets “Fine halftone dot reproduce ” / “High color registration accuracy”.